Microsoft just announced the release date of Windows 10, which is July 29, 2015. Windows 10 is said to make a change from Windows 8 and 8.1 which was the ultimate failure of Microsoft. 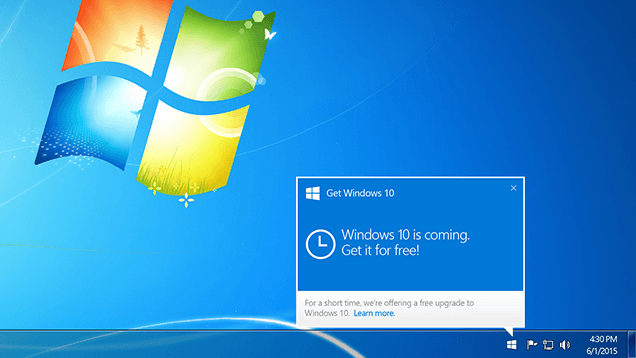 With Windows 10 now being a free upgrade for users on Windows 7, Windows 8 and Windows 8.1, will it make a change ? Microsoft has worked hard in developing Windows 10 and made the changes that users wanted. One of them is Aero Glass, which was removed in Windows 8. Windows 10 also comes with Cortana, a virtual assistant to make your life easier. Upgrading to Windows 10 will give you the ability to utilize Directx 12, a Windows 10 only feature. Will this be enough for all of those who skipped Windows 8 and stayed with Windows 7 ? If you are willing to upgrade to Windows 10, then you can reserve your copy by clicking on the new Taskbar app that is now available on Windows 7 and Windows 8/8.1. Microsoft has yet to reveal when it will be charging for Windows 10.